MakePE is a collection of CMD files used to automate the building of WinPE and WinRE. It offers MDT and DaRT Integration, as well as Driver Support and Customizations. Why did I create MakePE? MakePE was created out of necessity. I work in an environment that supports Windows 7, Windows 8.1, and now Windows 10. WinPE is used in my environment for OS Deployment (MDT), System Recovery (DaRT), and McAfee Encryption repairs. System Recovery and DaRT is OS specific. So if I am going to use System Recovery and DaRT, my WinPE has to match the Operating System. So this means I need to maintain WinPE 3 for Windows 7, WinPE 5 for Windows 8.1, and now WinPE 10 for Windows 10. 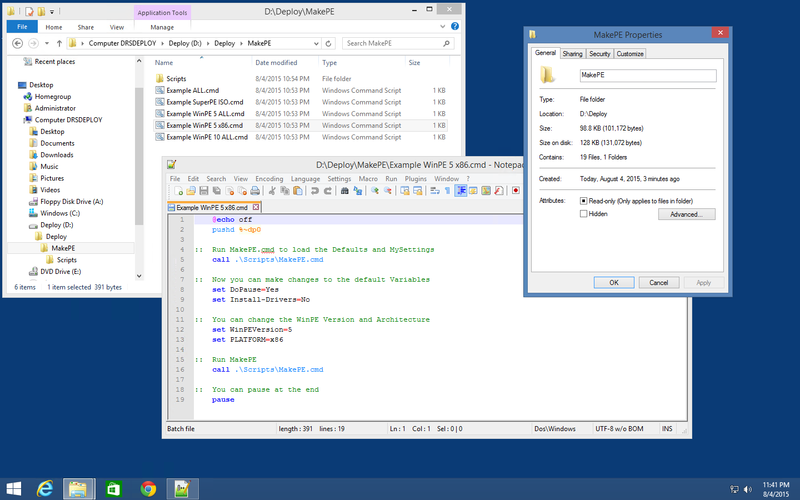 Additionally WinRE is customized in my environment with DaRT and MDT Integration. So I had been using MDT to create WinPE 5, and WinPE 3 was manually updated by mounting the WIM and manually configuring. Now with the release of MDT 2013 Update 1 which requires ADK for Windows 10, I needed a way other than MDT to build my WinPE versions. What OS’s can I run this on? Everything has been tested and functional on a Windows 8.1 and a Windows 10 Build computer. There are DISM errors encountered on Windows 7, so if you are in a Windows 7 environment only, use a Virtual Machine with Windows 8.1 or Windows 10 to do the builds. Any future plans for MakePE? Seriously, I have tried to think of everything and put it all together in a very easy format for you to take away and use. I may consider porting MakePE to HTA/VBS or PowerShell at a later date. What is SuperPE or SuperISO? SuperPE is a Multi-Boot WinPE so you can put all your supported WinPE versions all together, instead of having separate USB Drives. SuperISO is basically the same thing, but an ISO. If there is something that is not clear or detailed enough, leave a comment and I will see what I can do. I use makePE with winRE.wim for create deployment environment and it’s work perfectly, thanks for your tools ! But i want, when i boot from winRE usb stick, to automatically open the command prompt and execute a custom script, without needs to click “exit to the command prompt” in deployment window. I can do it with microsoft makewinpemedia tool and Winpeshl.ini or Startnet.cmd, but doesn’t work in winre image created by MakePE. Eric22, first of all, thanks for your reply. After posting MakePE 2 months ago, yours is the first comment, and validation that someone else has it working. I was beginning to wonder if I was just wasting my time putting stuff on this blog. That being said, I am curious how you came across my blog, and where you are located. Concerning your issue, I assume you are using MDT Integration correct? how to add wireless support to WinPE. wi-fi support but it did not work properly for me. So I did not need the deployment tool, only the command prompt. Devive i prepare are not linked to a domain but sent to our customers.